They're the conversations we have by the lifts, at bus stops and over garden fences. We call it small talk - but that doesn't mean it's of little importance. In this episode we tackle another big conversational no-no - politics. See what happens when Neil tries to ask Debbie about her voting habits. BBC Learning English Producers Kee and Sam then explain what's wrong with Neil's small talk and how he could make it better in future. I didn't think you were here today. Yep. Just the trains… loads of delays. Terrible, aren't they? Really awful. Next election, I tell you, I'm going to vote this lot out. Yeah, yeah things could be better. It's not great. So, who do you vote for normally? Who do you vote for? Which party? Are you political? Are you a member of a party? Um… Um… I'm sorry, I'm sorry… I just… I've just… I've just got to speak to someone. I thought he made a really strong start with the transport and the delays. And she was willing to answer those questions and talk about it. And we love talking about delayed trains in the UK. He could have talked about his own journey in. But instead he went for something else. And yeah… you can… even talking about politics, the fact that there's a general election – fair enough, you can say, 'Oh yeah, things are interesting at the moment with the general election', but you could leave it there. You wouldn't talk about who you voted for. And also, they're in the canteen. 'What have you got for breakfast?' A lot of clues in there – things that you could talk about. Absolutely. He had something in his hand. She was clearly on her way to get something. Sure, yeah. And I think as soon as he asked that question, she was looking for an excuse to get away from him. So the signs were there, like you say. Written all over her face. 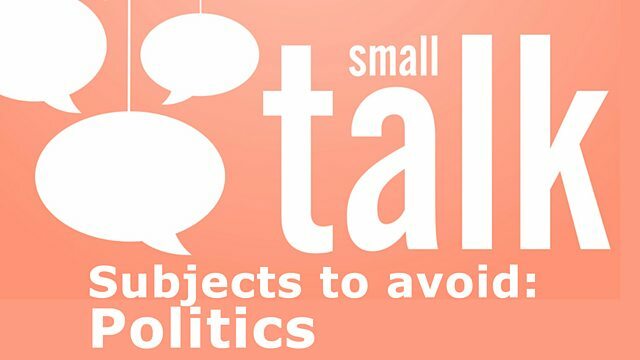 Non-controversial topics, such as the weather or someone's journey, make good small talk conversations. The idea is to create a pleasant environment, not bring up something which could lead to conflict. People tend not to share their political opinions with strangers or people they don't know very well - and voting is very private. You might not even know who your closest friends and family vote for! Does Debbie engage with the discussion about the reliability of trains? Is asking about a person's journey a good topic for small talk? Debbie makes an excuse to leave. Why? Which of these suggestions does Kee make for continuing the conversation on a topic other than politics? Join us in Session 13 of The Experiment for Phrase Frenzy - a video quiz which tets your knowledge of English idioms.